Scientists have developed a new adhesive structure that improves adhesion, even to rough surface. Adhesion is involved whenever industrial components are moved without leaving any residues behind. But the surfaces of these objects are never completely smooth. Even those surfaces that appear smooth to the human eye tend to be rough when observed under a microscope. 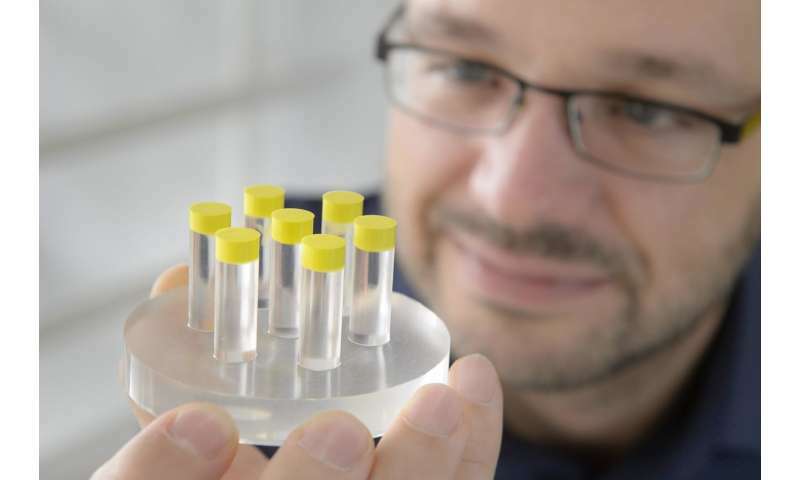 Scientists at the Leibniz Institute for New Materials have developed a new adhesive structure ensuring adhesion, even to these types of rough surfaces. They determined that the combination of hard and soft materials adheres significantly better to rough surfaces compared to structures produced from only a single soft material. As a result, industrial handling processes can be improved and made safer. Additionally, the materials are promising for on-skin applications such as self-adhesive wound closures or "wearables—networked computers that can be applied directly to the skin. The scientists presented their findings in Applied Materials & Interfaces. As part of their investigations, the research scientists developed two-millimeter pillars as a model system and brought these into contact with rough surfaces. The used the force required to peel the pillar away again as the measure of adhesion. "The pillars that we used were made of a hard material, but their ends had a layer of soft plastic. In order to peel away this pillar, we needed to apply a force that was five times greater compared to peeling away a pillar composed entirely of the soft material. Therefore, it clearly adheres better," explains René Hensel, the Deputy Head of the Functional Microstructures program division. The research scientists established that the quality of adhesion corresponds to the softness and thinness of the coating applied to the ends of the pillars. The softer the material, the better its ability to adapt to rough surfaces. The fact that adhesive strength correlates to how thin the coating is goes hand in hand with the delayed formation of cracks during contact: The adhesive structure detaches from the surface whenever a crack forms. These cracks take longer to form due to reduced stress peaks. As a result, cracks and detachment only occur under higher loads. "Surprisingly, the thinner the coating is, the more pronounced this phenomenon," adds Hensel. Adhesion is also affected by the shape—how two materials of varying hardness are combined. A rounded boundary layer between both materials improves adhesion. This also appears to affect the formation of cracks. The thickness of the soft coating should simultaneously match the degree of roughness: "The surface of woodchip wallpaper is far rougher than skin, for instance, so in order for something to adhere to woodchip wallpaper, a much thicker soft coating must be selected compared to adhesion to skin," says Hensel. The research scientists are currently very interested in adhesion to skin. This is central to future research as it appears to play a particularly important role in the development of "wearables" as well as for treating wounds.